This is another one of those recipes where you can throw in whatever veggies you have on hand (and need to eat!). That is my favorite kind of recipe because I love it when you can still make a dish even if you don’t have all the “exact” ingredients. Plus if you don’t like a certain vegetable then leave it out…you can use whatever you and your family like! And I must share that my picky daughter, who normally doesn’t even eat very many vegetables, asked for thirds of the pictured vegetable pancakes. I used a mix of sweet potatoes, carrots and zucchini. I think the sweet potatoes helped to “sweeten it up,” and she absolutely loves sour cream so this side item ended up being a very big hit! Combine the shredded veggies with the eggs, flour, and salt. Mix thoroughly. Heat a thin layer of olive oil in a sauté pan over medium heat. It is important that the heat is the right temperature because you want the pancakes to cook all the way through the middle by the time they are brown on the outside. Once the oil has heated up add pancake size dollops of the veggie mixture into the pan. Cook for several minutes until the bottom starts to brown. Then flip and repeat. Transfer cooked pancakes to a plate lined with paper towels. Serve warm with sour cream and/or applesauce. We just made these for dinner tonight. I used a sweet potato, 2 carrots, and 1 yellow squash. I mixed it about 45 minutes before cooking. It set on the counter and what moisture was there from the squash I poured out. They turned out great. We tried several different combinations of toppings…..maple syrup, cayenne hot sauce, ketchup, and salt. My favorite was hot sauce and ketchup together although my husband really liked the maple syrup. I think the family liked them and we will make them again. I love that the combinations can be different each time. Thank you for a delicious and easy way to use up veggies! We have an overload of veggies in our garden and have used different mixtures of; kohlrabi, yellow squash, zucchini, kale, carrots, green tomatoes (I will peel the skin next time), and chopped banana peppers. I always double the recipe for our family; 2 adults, 2 young kids, and have just the right amount. For a little extra taste I’ve added things like garlic and herb blend, cumin, Italian herb blend, chili powder (my 2 yr old did not like the spice). We use plan yogurt for our dip. Glad to have this recipe in my weekly line up!!! Has anyone tried it with shredded eggplant? My 15-year old niece and I had these for dinner last night. We used some leftover Yukon Gold potatoes, zucchini and carrots for a little extra crunch. They were simply delicious. She absolutely loved them. It is definitely a great way to use leftover veggies, and SO quick and simple to make. Amazing! My 14 month old LOVED them! I doubled the recipe and used 1/4 of each of these four veggies: white potatoes, spinach, beets and carrots. After sitting there for about 20 minutes, the mixture looked super watery so I drained it pretty good but still left it very moist. The first round, I had added minced garlic and onion powder. For the second batch, I added a lot more onion powder. The third batch, I added allspice. My favorite were the 2nd batch. I think onion would definitely be a good addition no matter what other veggies. I’m making a few more batches for my lunches this week. Thank you for the recipe. Has anyone tried this recipe with a grain free flour? I am definitely going to try this recipe and may even have to blog about it. Thanks. Hi! My four year old and I just made these and are eating them at the counter right now! My question is – can we make a bunch and freeze and warm up at a later date – do they freeze well?! I made these tonight, and the mixture was quite gloppy (there was even quite a bit of liquid in the bottom of the bowl after I scooped out all the veggies). I ended up having to finish them in the oven to get them to set up in the middle. Is it normal for the mixture to be so wet or do you think I messed up? They were delicious though! The teenager had seconds, so that is definitely a plus! 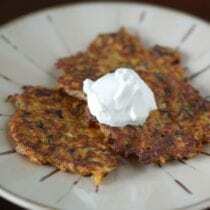 My family has often made dished with shredded potatoes (latkes and potato kugels). One trick that we learned is that the potatoes need to be VERY WELL DRAINED. I shred the potatoes in the food processor, rinse them in a colander and then squeeze the living daylights out of them to get them as dry as possible. Also keep in mind that zucchini and squash will release water as the cook. Are these made from left over veggies that are already cooked or can I use raw veggies? I wasn’t sure if I used raw carrots or sweet potatoes that they would cook? Thanks! Hi Terry. The veggies are raw and they will cook through. Do you have any recommendations for an egg substitute? My son has an egg allergy and I’ve tried similar recipes with flax eggs and baking powder but the veggie pancakes always seem to fall apart. Hi Meghan. Nothing binds quite like egg. 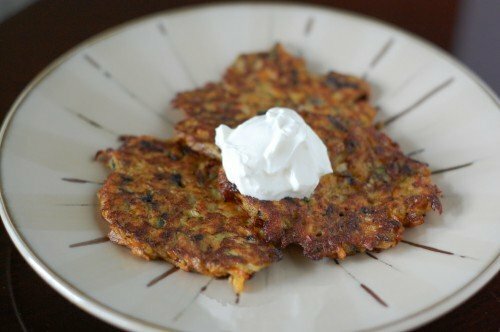 Here is an egg-less recipe that might give you some guidance: http://www.food.com/recipe/vegan-paleo-vegetable-pancakes-510895. You can substitute a flax “egg” in many recipes. Just mix 1 tbls flax meal and 2 and 1/2 tbls water, and let set for a few minutes. I made these tonight and my family didn’t like them. I used potato, carrot, and a little sweet potato. I followed the recipe to the letter. The mixture was very watery. In the pan, they didn’t hold together very well and were a bit difficult to flip. They also made a mess out of my cast iron pan by sticking in many places. After supper I read some of comments and discovered that I should have drained the water from the veggies before continuing with the recipe. That would be information to have IN the recipe as well as how thick/thin to make the pancakes. I received the 100 Days cookbook for Christmas and have REALLY enjoyed the recipes I’ve tried so far except this one. My family LOVE’s this recipe, even my 7 year old. I make as direct and usually use one white potato, carrot and zucchini. If you let it sit too long the egg mixture does pool at the bottom of your bowl so I always toss the mixture each time I place some in the pan. I use a bit more oil then directed and that helps them get crispy on the outside. Just wondering if these freeze well? Just made these. My kids were not excited when they heard they were having veggie pancakes for lunch, but they devoured them after one bite. I added a little more salt to taste and cooked in avocado oil. Glad I also took the time to squeeze out the excess moisture in the shredded veggies before adding the egg and flour. This helped to make them crisper instead of spongy. Absolutely delicious! Great way to use up excess veggies. Has anyone tried this with a flax egg? I did try this with a flax egg as my son has an egg allergy. They did not hold together well at all. Nothing binds quite like egg unfortunately. I wonder if it would work better with mashed up white beans? We have the egg allergy too, always trying to make things like this! maybe adding some beans to make the mixture sticky as I have successfully made a black bean burgers without egg, and it stuck well together using a bit more flour and put burgers in fridge before cooking. I make mine with 1/2 cup of flour and a splash of water. I also fry in a little sesame oil..adds an Asian inspired flavour. These are so good! My husband and I both loved them. I had about 3/4 C shredded carrots left over from another recipe, so I tossed those in with 1/4 grated zucchini and 1 C grated sweet potatoes. I substituted 1 TBSP flax meal for the flour to keep them gluten-free. They were amazing! Just a tiny dab of applesauce was a perfect topping. Looking forward to trying other veggies. We can’t do dairy. What else would be good to top with besides sour cream or applesauce? Hi. I’ve used coconut milk yogurt. Yes, you can. I reheat them on a skillet. Hi! Can you use almond flour or flax seed instead of whole wheat flour? do you have to partially cook the white or sweet potato before shredding? Hello there. No, you do not need to cook them first.